The exhibition Edward Borein: The Artist’s Life and Work celebrates the talents of this esteemed western artist with 53 watercolors, etchings, and pen-and-ink sketches drawn solely from the collection of the Rockwell Museum in Corning, NY. Organized by Rockwell curator of collections Robyn G. Peterson, the exhibition is on view at the Panhandle-Plains Historical Museum, Canyon, TX, from June 12 through August 22 and at the Santa Barbara Historical Museum, CA, from September 23 through December 5. When thinking of old California, we generally conjure up images of Spanish missions, Mexican vaqueros, and gold-seeking forty-niners rather than cowboys and cattle ranches. But the cattle ranching industry – and the cowboy lifestyle – flourished on the West Coast until the late 1890s. Prominent among the California cowboys late in the 19th century was artist Edward Borein. Born to a deputy sheriff in San Leandro, CA, in 1872, Borein dreamed of growing up to be a cowboy. He realized his vision in 1893 when he began driving herds throughout California and down into Mexico. While becoming an experienced cowpuncher, Borein also refined his sketching and drawing skill – pursuing an artistic passion he had held since childhood. 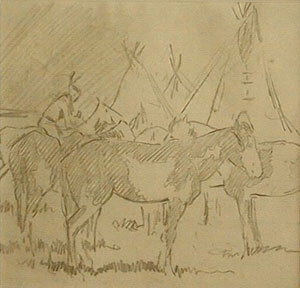 Edward Borein, Southern Cheyenne Village, Pencil on Lined Paper, c. 1900, 6" x 6"
Borein’s working-cowboy status made him fairly unique in western American art at the time. 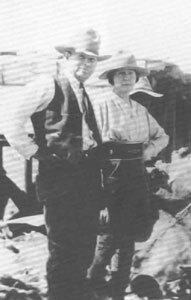 With the exception of Charles M. Russell, Will James, and Taos, NM, artist W. Herbert Dunton – a mediocre cowboy by his own admission – few artists of this era worked as cowboys in the West for an extended period. Also setting Borein apart as a western artist was his choice of media: primarily watercolor, etching, and ink drawings, the latter initially dictated by his illustration work but later found to suit his expressions of motion and power. Because of his fairly fast-paced working method and relatively spare style, Borein had difficulty with oil painting. Further, when he compared his own work to Russell’s he felt is so inferior that he gave up oil painting almost entirely. But with watercolors – despite initial struggles – Borein mastered the medium, producing more than 1,000 documented examples. Edward Borein, Pencil Sketches, 4" x 14"
Borein’s work in etching coincided with a printmaking rebirth in the United States in the early 1900s. The artist capitalized on the linear basis of etching by allowing the power of line and the richness of the ink to create the power of the image. Borein’s etchings, totaling more than 400, blazed new trails for “cowboy artists” as none were as committed to the medium as he was. Borein who died in 1945, rendered the West honestly and without pretense. Along the way he became one of the most celebrated western artists of the early 20th century. 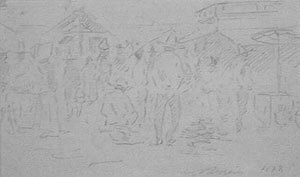 Edward Borein, Mexican Market, Pencil on Paper, c. 1897, 3" x 6"